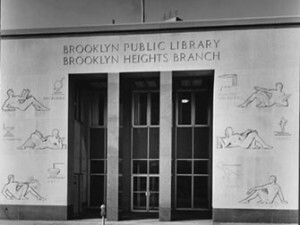 Brooklyn Heights resident/blogger/lawyer/urban planner Michael DD White’s recent blog post about the possible replacements for the current Brooklyn Heights library has the interwebs abuzz this week. Brownstoner characterized it as having “plenty of conspiracy theories about how this is all a big set-up for another land grab by Forest City Ratner”. A spokesman from the Brooklyn Public Library has contacted The Observer to dispute Michael White’s assertion that Josh Nachowitz has said to anyone that a building on the site of the Brooklyn Heights branch could reach forty stories. Regarding the height of any potential building, he said that discussions are not that far along. The current zoning of the site would allow for a floor-area ratio of 12 (with the affordable housing bonus)—assuming the site were built out to its maximum zoning capacity, a building taller than about twenty stories seems unrealistic to us. FAR of 12 could easily translate to 40 stories with an exemption for the new library floors, affordable housing bonus and double-height penthouse stories.